NASA’s Fermi Gamma-ray Space Telescope and other satellites have recorded a record flare from a black hole at the center of the distant galaxy 3C 279. 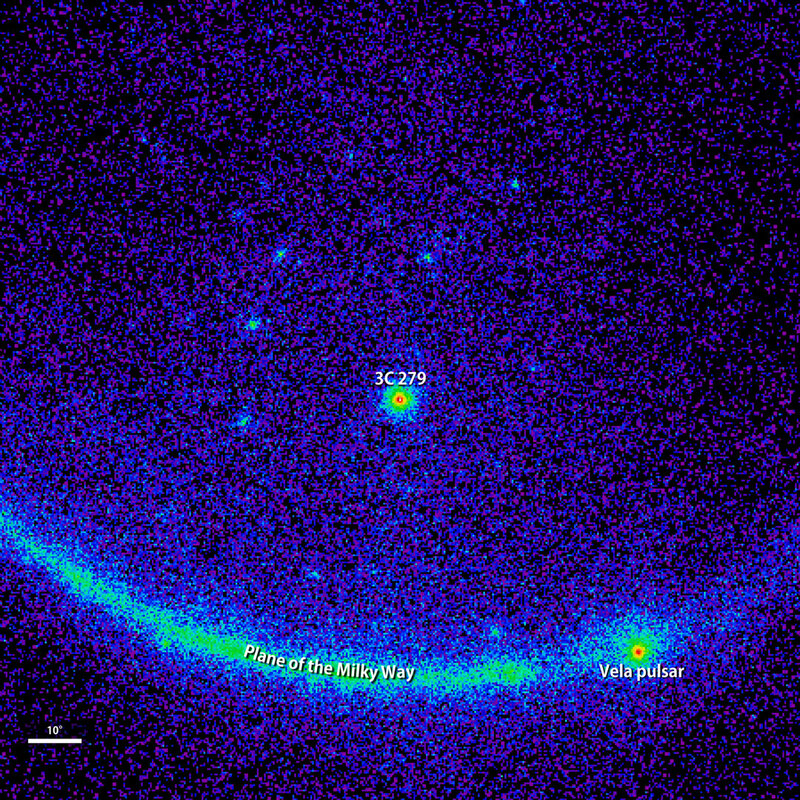 Five billion years ago, a great disturbance rocked a region near the monster black hole at the center of galaxy 3C 279. On June 14, the pulse of high-energy light produced by this event finally arrived at Earth, setting off detectors aboard NASA’s Fermi Gamma-ray Space Telescope and other satellites. Astronomers around the world turned instruments toward the galaxy to observe this brief but record-setting flare in greater detail. “One day 3C 279 was just one of many active galaxies we see, and the next day it was the brightest thing in the gamma-ray sky,” said Sara Cutini, a Fermi Large Area Telescope scientist at the Italian Space Agency’s Science Data Center in Rome. 3C 279 is a famous blazar, a galaxy whose high-energy activity is powered by a central supermassive black hole weighing up to a billion times the sun’s mass and roughly the size of our planetary system. As matter falls toward the black hole, some particles race away at nearly the speed of light along a pair of jets pointed in opposite directions. What makes a blazar so bright is that one of these particle jets happens to be aimed almost straight at us. “This flare is the most dynamic outburst Fermi has seen in its seven years of operation, becoming 10 times brighter overnight,” said Elizabeth Hays, a Fermi deputy project scientist at NASA’s Goddard Space Flight Center in Greenbelt, Maryland. Astronomers think some change within the jet is likely responsible for the flare, but they don’t know what it is. This visualization shows gamma rays detected during 3C 279’s big flare by the LAT instrument on NASA’s Fermi satellite. Gamma rays are represented as expanding circles reminiscent of raindrops on water. The flare is an abrupt shower of “rain” that trails off toward the end of the movie. Both the maximum size of the circle and its color represent the energy of the gamma ray, with white lowest and magenta highest. In a second version of the visualization, a background map shows how the LAT detects 3C 279 and other sources by accumulating high-energy photons over time (brighter squares reflect higher numbers of gamma rays). The movie starts on June 14 and ends June 17. The area shown is a region of the sky five degrees on a side and centered on the position of 3C 279. The Italian Space Agency’s AGILE gamma-ray satellite first reported the flare, followed by Fermi. Rapid follow-up observations were made by NASA’s Swift satellite and the European Space Agency’s INTEGRAL spacecraft, which just happened to be looking in the right direction, along with optical and radio telescopes on the ground. Mid-June proved to be an intense period for the Fermi team. As the satellite’s Large Area Telescope studied 3C 279, its Gamma-ray Burst Monitor became the busiest it has ever been since the start of the mission. The instrument picked up a series of eruptions on the sun, which is unusual in itself, as well as multiple outbursts from V404 Cygni, a binary system containing a black hole that erupts every few decades. NASA’s Fermi Gamma-ray Space Telescope is an astrophysics and particle physics partnership mission, developed in collaboration with the U.S. Department of Energy and important contributions from academic institutions and partners in France, Germany, Italy, Japan, Sweden and the United States. Be the first to comment on "Fermi Views Blazar 3C 279’s Record Gamma-Ray Flare"